UNIVERSITY of Queensland researchers are working hard to uncover a mystery killer lurking in their own backyard. 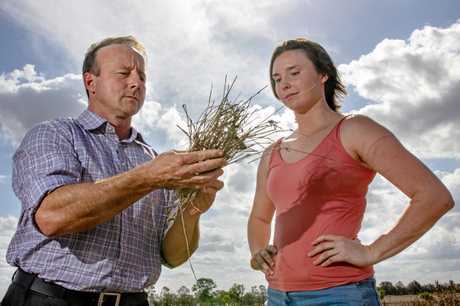 UQ School of Agriculture and Food Sciences lecturer Dr Anthony Young is leading a team trying to discover the cause of pasture dieback, after the condition was identified at two sites at the Gatton campus. The condition has been known since the 90s, but Dr Young said the cause was still a mystery. "Pastures die over a course of several weeks and render the land unproductive, and we simply don't know why," Dr Young said. Despite affecting an estimated 34,000 hectares of farmland throughout Queensland, there are no known treatments. Since the discovery of the two sites at UQ Gatton in March last year, Dr Young and his team have been working to attempt to isolate a cause. "We don't know whether it's an insect, or a fungus, or a bacterium or a nematode in the soil," he said. "We're trying to exclude different factors, we're doing analysis on all those different factors to see if anything stands out as a causal agent." He said however the cause may be more complicated, and rather than being a single underlying factor, it could be a combination of different issues interacting. The researchers have also spent time in the field across the region, identifying and taking samples from properties also affected. Dr Young issued a call for more producers to become involved, and said the more examples of dieback they can investigate, the better their chances of solving the mystery. "Unless we have a number of different sights we can investigate, we might not come up with the answer," he said. If we find something that solves it here, we expect that's going to have great benefits for Queensland in general. Producers who believe they have dieback on their properties should contact Dr Young via the UQ website. Symptoms of dieback include the yellowing or reddening of leaves, the emergence of broad-leaf weeds in areas of dead grass, and, after rain, patches of pasture not rejuvenating like surrounding areas. Dieback leaves property owners feeling "helpless"
LAND owners say the increasing attention for researchers pasture dieback is attracting is encouraging. Despite the condition first being identified in the 90s, the still no known cause or treatment. Marburg land owner Fiona McAdam runs seven of her own steers and two horses on her 295 acre (119 hectare) property. She also allows her neighbours to run up to fifty of their dairy cattle on her land. Two-and-a-half years ago, Ms McAdam first identified pasture dieback on her land. "I noticed that part of our hill was brown where as the rest of the property was green," Ms McAdam said. "It took a bit of time to get to the bottom of it." The original area of pasture she identified is still affected to this day, and worryingly, additional sites have been identified since. "It just seems to be slowly spreading," she said. That's the problem with dieback - no one's come up with a cure. She said the spread of the condition on her property was a worrying prospect. "You feel helpless. And then when you ask what can be done to stop it, there's no answers," she said. 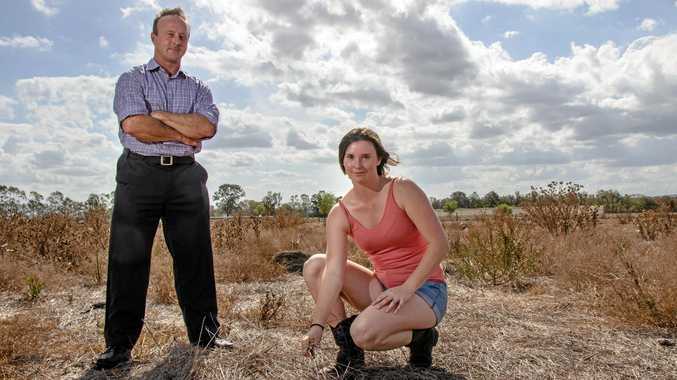 Pasture dieback is becoming a serious challenge facing the agriculture industry in Queensland, and Ms McAdam said there were a lot of property owners in worse positions than her. But she said the increasing attention from researchers through out the industry into finding a cause and hopefully a cure was positive. "They're trying their hardest to work out solutions. It's encouraging," she said.